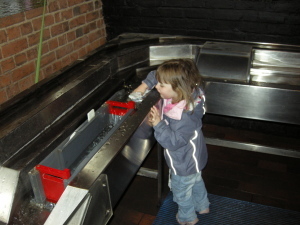 I took my three year old daughter and baby son to the National Waterways Museum in Gloucester. 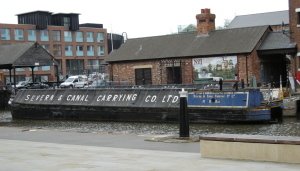 This is one of three museums operated by the Waterways Trust under the name of National Waterways Museum. 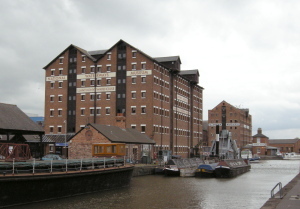 The three museums are at: Ellesmere Port, Gloucester Docks and Stoke Bruerne. The first problem was finding somewhere to park. Although the Gloucester Docks were well signposted from the M5 when we got into the area with the docks the signs were not nearly as good. There were signs to a coach park, and some signs which appeared to be for shoppers rather than visitors to the docks. We parked in a NCP car park which appeared to be close to the museum, but actually turned out to be at the other side of the docks and was very expensive. The better car parks are signed under “alternative car park”, or one located directly outside of the main entrance to the museum, both of which were cheaper and closer than the one we parked in. Entry to the museum was reasonably priced and under 5s are free which is a real plus. Also if you plan to visit again within 12 months (or to visit one of the other two museums) then you may be better of with an annual ticket which is about the same price as 2 visits. The museum is split across two floors with a few outside exhibits and optional boat rides (running on specific days / times). Inside the museum has good disabled access – which was great as I had a double buggy with us. The buggy only just fit into the lift, but the museum had plenty of space to get around. Taking a three year old to a museum can be a bit hit or miss depending upon how the museum is designed. I’m pleased to say this museum is great for kids. Most of the museum consists of hands on exhibits, with just a few glass cases for the fragile exhibits (such as a shotgun, tools, clothes etc). Downstairs there is a short hands-on exhibit on the environment and the roll that the canals play. Then going into the main part of the museum it’s all hands on, with a few opportunities for kids to play with water. The exhibits included an opportunity to build a Lego bridge, to race different shaped boats and to float a boat down through lock gates and up a canal lift. Some of the parts were a little on the tall side for our (fairly tall) three year old, but she was just able to manage. The only bit should couldn’t operate was the lift bridge. There were also some computer touch-screens to play at being a canal engineer, a boat builder and a boat decorator. It’s just a shame that it wasn’t possible to print the finished boat “Amelia” as that would have made a great souvenir. Upstairs the museum focussed more on the life of boaters and those running the canals. There are still a few hands-on exhibits include an opportunity to emboss (stamp) the name of the museum onto a bookmark / souvenir and a pulley demonstration. There was also an opportunity to dress-up as olden day canal folk and some videos were being played on TV screens. To take a good look around the museum can easily occupy two hours or more, but with a restless child we stayed for just over an hour. We talked with the lady running the shop who said that many people don’t go into the museum saying that museums are not suitable for children. That is a real shame as this museum is great for kids and adults alike. There are not many kids that will turn down the opportunity to race boats or to float boats down a model canal, and older children will love testing their strength lifting the bags of flour. We didn’t need to use the baby changing / other facilities, but based on the rest of the museum I’m sure it’s something they have included. There is also a cafe next to the museum which we didn’t try. I’d definitely recommend it as a day out for children, suitable for all weather and ages. See more reviews of days out with babies and young children on Watkissonline.co.uk baby and kids pages. This entry was posted on Sunday, October 19th, 2008 and is filed under Babies, Children, General, Tourism. You can follow any responses to this entry through the RSS 2.0 feed. Both comments and pings are currently closed.